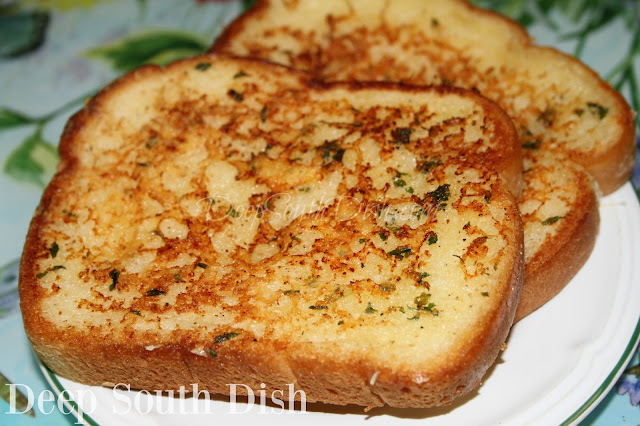 Skillet Parmesan Cheese Toast - a garlic butter bread with Parmesan cheese, toasted in a skillet! 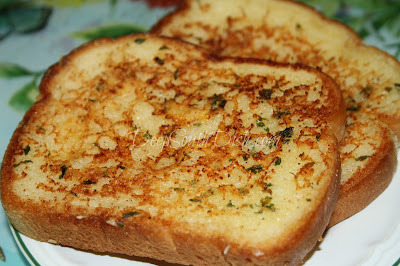 I have a favorite garlic bread butter blend that I have been using for years. It's an awesome blend for garlic bread that not only goes with many meals, but I also use some form of it for other things, like my over the top cheesy bread, my French bread pizza with a twist, and an oven toasted garlic bread that adds a sprinkle of Parmesan to the mix, and what this is patterned after. I love them all, though my biggest problem with any of them I guess, is that I am a complete and total bread addict. I. Love. Bread. And, I can easily overeat it. Seriously, I could eat an entire loaf of French bread in one sitting if I don't restrain myself. I am not alone in this attraction, as my oldest grandson can knock out a half loaf himself when he gets here after school! I know how he feels. It must be an inherited trait because Mama used to talk about how they would travel up the road to fetch fresh, hot French bread from the bakery for their Mama for supper and, when they were lucky, with enough to buy extra to eat on the way back! We both get it honest I'd say. The beauty of this recipe is that you can easily reduce or increase it as you need to, meaning you can prepare as much or as little as you want, even just a couple of slices! It's a step up from typical garlic bread with the ease of making it in a skillet. Here's how to make it. First, preheat a large non-stick skillet or griddle over medium high. Blend together the butter with the next six ingredients. While you can technically use any kind of bread, even slicing up your own French bread, I like the thicker cut breads like Texas toast, or, my new favorite, this Artesano bread from Sara Lee. Boy is this stuff good y'all... be sure to look for it at your favorite store! Spread the butter blend evenly on only one side of the slices of bread. Top with the Parmesan cheese, pressing lightly into the butter. I buy small blocks of the good stuff and use my hand-held FreshSaver to seal the bags and keep it fresh. A microplane is also the perfect tool for this bread because it grates the cheese so nice and fine. Place the bread, butter side down, in the hot pan or griddle and toast until golden brown. I'm using one of those Gotham Steel copper pans. Love those too! Turn and lightly brown other side of bread to warm though. For more of my favorite bread recipes, visit my page on Pinterest! Preheat a large non-stick skillet or griddle over medium high. Blend together the butter with the next six ingredients. Spread the butter blend evenly on only one side of the slices of bread and top with cheese, pressing lightly into the butter. Place in hot pan or griddle, butter side down, and toast until golden brown; turn and lightly brown other side of bread to warm though. Serve right away. Cook's Notes: Makes a fabulous grilled cheese sandwich. 1 HUNGRY PERSON COMMENTED. ADD YOURS. I think your ingredients (minus the bread) would be a great compound butter to put under the skin of a chicken, a nice slice on top of a cooked steak, etc etc. After saying this I am sooo excited to offer this on bread, toasted for my husband who also LOVES BREAD A LOT!!! !